Either way, it's been nice. A bed doesn't get much cozier than when it has two books and a baby in it. And sometimes two very large bowls of cheerios. Beautiful Sidney :)I love your style..
Just want you to know, I adore you. :) Happy Monday! Love the hat its so cute!!! Love to read...what are you reading? Little Everett is so cute. Cute pants - I am loving coloured jeans at the moment! I've been lamenting on what kind to buy for a while now. I think I'm going to go with magenta. 'Cause I can't help but love pink. Nothing like family story time! And you look amazing in these shots...love the cobalt pants!! Love this outfit! and Gorgeous as usual! I have been doing a lot of reading lately as well. Laying on bed with a book in hand is now my favorite winter activity. such a fun outfit! love the color of the pants! I love reading so much. It's always nice to just turn all technology off for a little bit and just read. My boyfriend and I made the resolution to read more as well! That hat is adorable! 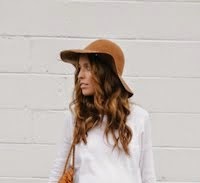 I wish I could pull off floppy hats. Sounds like a marriage I want! Most women aren't thinking about that, but I can't wait to have lazy days like that with my future husband and baby! I love the boots as well! Very cool and cute, I never find things like that target when i go. Yay for reading. I have been doing more of it myself. I am just finishing up the Hunger Games. what are you reading? Yay for reading, it's one of my favorite things! great picture selection!! i enjoyed them a lot. :) thanks for sharing!! super cute outfit! I love reading time :) Wish I had time to more often. I've been reading so much since we moved to Amsterdam. It's the best way to kill time on the train. And now I'm just addicted! I'm currently reading "From Black Heels to Tractor Wheels" by the Pioneer Woman and it is absolutely hilarious and so cute. Definite mood lifter! I highly recommend it! I applaud you for reading, I hope you keep it up throughout the year and not only January. I love reading but with all the reading I have to do for school, when I come home picking up a book is usually not my first choice. When vacations and summer come around there's nothing that can get between me and my book. Slightly envious as to how you spend your weekend :) Hope baby Everett is doing well. Have a great week! Man, you really are selling me on the whole having a baby thing, it sounds like the best thing ever! Love your blue jeans! it aaaalmost feels like springtime! those are some blue pants. and i like 'em. and... i want to crawl back under the covers and grab a book ASAP now! happy to hear you guys are still on the New Year's resolution wagon. So far so good for me too! Moments were you can't communicate something ridiculously funny. We've all fallen victim to it! You look amazing. Can't believe you just had a baby that long ago. A baby in a bed is great! Love taking naps with my little one! That so sweet. And I completely adore that hat! i bought "heat wave" at sephora yesterday and thought of you. my hubs is a little skeptical, but my mother-in-law loves it. so, score? Awe you guys are such good parents! You rocked those cobalt skinny jeans! Glad you guys are sticking to the reading new years resolution, thats a great resolution. The bright blue pants are amazing on you! I'm obviously the one one who hasn't jumped on the colored denim bandwago. I need to do that ASAP. Your outfit is great!! Those pants are ridiculously AWESOME. I loved when my baby was still sleeping most of the time and we could have lounging parties on the bed- soak it up! But look forward to future cuddle sessions when he won't be sleeping but may climb all over you and give you hugs! love those pants! I'm really getting into the whole colored pants movement, for years I've been a skeptic. WE have stuck to our resolutions too. So far so good. . . love your blog! Cheerios and a book in bed sounds like a good idea right. Now if we could only get the baby part in there... 10 days is seeming like torture! I love your style, and gorgeous electric blue jeans! This outfit is so perfect, loving the bright jeans. The scene with the books and the baby is too cozy and adorable! Love the blue! I recently got the red jeans and can't wait to sport them. They just might have to show up on my blog soon! im curious- What book are you reading? I look forward to your posts everyday. They always find a way to make my day a little better. Oh, and that urban outfitters hat, what a steal! beautiful combo of your outfit. chic and comfy! and the cobalt blue jeans is an amazing color! That's such a lovely thing to do. I was just reading a book where the leading lady wants to be with a guy where they both can sit next to each other and quietly read. I'd love that too! But sounds like you got that already with a cute baby and cheerios to hoot! Good on you! You should let us know what you're reading and what you think about it! I love book reccomendations! I eat cheerios when I read too! In fact, I totally just decided to go buy more cheerios, because I have none at the moment. And isnt it such a letdown when the part that tickled you so much, strikes no one else the same way. Gawsh. Im in love with the blue pants! they really give this outfit something bold and fresh :) I also love how you put together a lot of really nice looks at a low price! Reading. Marriage. Babies. And omgoodness good cereal. Amen. I have those boots too!! Don't you love them?!?! I love the idea of pairing them with a bright pant! Love the outfit! there is no way you just had a baby. and that eyebrow picture below... oh my heck awesome. he is going to be a actor. you better watch out when he is making all the ladies swoon. Oh, and that outift? Gorgeous! When you said "Code for 'wow. your mouth looks huge from this angle'. I laughed out loud. BRAVO! I love your hat! So cute. It's so awkward when you think something is HILARIOUS and the person you tell it to is just like "... ha ..."
I love reading too but it is difficuly sometimes to find time for doing everything. And I do not have a baby yet, I am wondering how you can manage to keep on going! Check on the first Professional of Fashion’s interview on my blog! I’d love your comment on it. SO SWEET!! You are adorable! I agree with another post, I look forward to your posts because they brighten my day. I've told all of my girlfriends about your blog. Thanks for giving me an idea about how to wear one of those fabulous floppy hats, JEANS! And I have been reluctant to try the colored jean phenom, but I am now inspired to give it a go. loving those blue jeans, perfect to brighten up any winter! You look so posh! I love the blue trousers. I'm still up in the air about trying colored trousers out but you look super chic. Love the scenery as well! That's great~! What are you guys reading? Love the floppy hat and the printed top! I love your style, but I don't think I could pull off skinnies. As always I adore the bricks and everywhere you photograph. love your colored pants, lady! LOVE those bright blue pants! Someone at my office wore a pair of bright cobalt blue jeans the other day, too, and now I can't wait to go buy a pair! your outfit is gorgeous! i am really loving your boots! Love the cobalt with your blonde locks. beautiful photos! did you set-up a tripod, or have someone take them? they're great. I love the color of these pants with the hat! Such a great combo! Those jeans! I love them!